Perhaps one of these days I’ll put up the story behind those cds, but today I don’t feel like it. 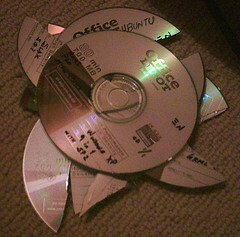 Maybe one of these days..
Betwen noesh’s new computer and those discs I haven’t felt like putting anything ’round here. El mundo es cruel y despiadado….